What you can expect this round? It is Blue Evo X and Regular or Super Treasure Hunt Qumbee wave. Among the Matchbox, you will find Benz Mini Van and Civic Type R.
Each store will get half carton of Hot Wheels and Matchbox, this also means you may not get T-Hunt and Civic Type R every stores. Together the promotion, complete carton of pack of 3 available for your selection. The assortments same with Cold Storage wave contained Orange Civic, black Datsun and white Ferrari. 1) The 3-pack is not cheap. 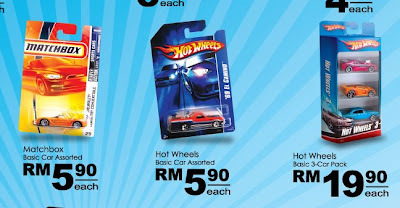 Atleast have some discount to make the cars less than RM 6.50 each. By right more cars per pack = cheaper. 3) Some of the cars are leftovers from the previous 7'11 promo, which used to cost alot less. MBX is ok since there are some new stuff, but some 7'lls have alot of leftovers from last year. These Hot Wheels cars are the best toys ever.. Hot Wheels is a brand of die cast toy car. Cars and trucks were manufactured to approximately 1:64 scale and designed to be used on associated Hot Wheels track sets.